I ❤ roast chicken. You don't have to do too much to make it a delicious meal. It is soOooo convenient. 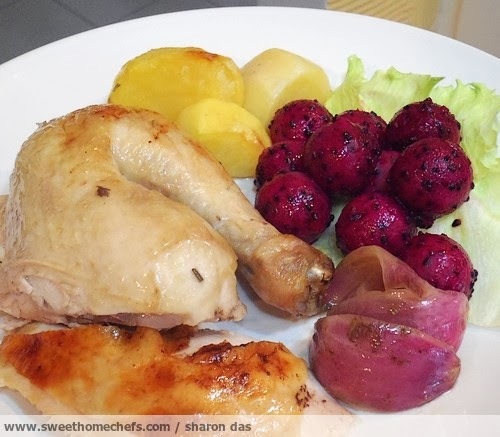 For me, it's matter of spreading a few basic ingredients over the chicken and voila! Into the oven it goes. A couple of hours later, dinner is ready. But I have a totally different take for festive occasions. 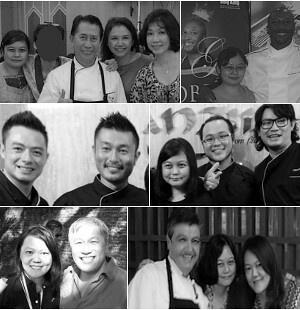 Special occasions are seasons for complicated recipes. This feeling is not out of any need to impress friends. It's because of the excitement I feel from the positive energy that surrounds the special occasion. It just screams, "Churn out something magical for 'eat' gathering!". Anyway, this is how I usually make roast chicken on normal days. It is lightly seasoned with salt, rubbed with butter, dried herbs and some sort of fruit like oranges, mangoes, apples or lemons. I chose to go with lemon this time. One can never go wrong with lemon. The aroma that wafts through the air in the midst of roasting is heavenly. Makes me drool thinking about it. If you're wondering whether it tastes sour. It doesn't. It has this savoury lemon flavour without any of that 'sour' taste. Yum stuff. Check out the recipe below. 1) Rub salt, rosemary and half of the butter all over the chicken. Stuff a wedge of onion into the chicken. 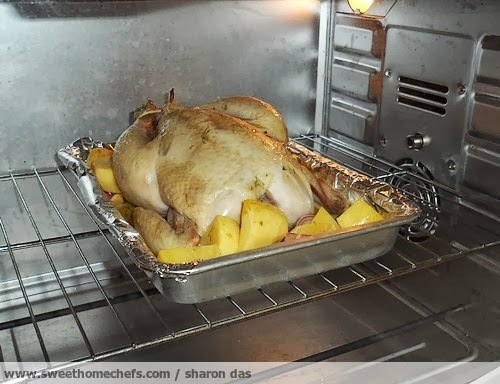 2) Line roasting tray with foil and brush on a bit of butter. 3) Place chicken onto the tray. 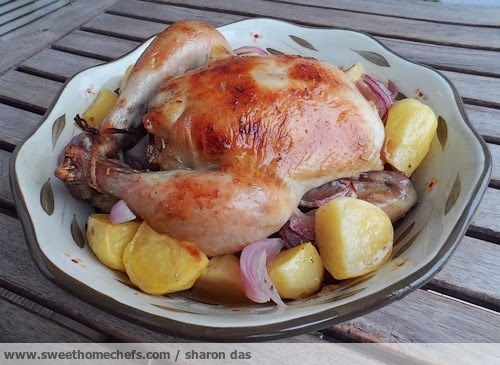 Arrange potatoes and onions around the chicken. 4) Spread remaining butter over the potatoes and onion. 5) Squeeze lemon juice over it. 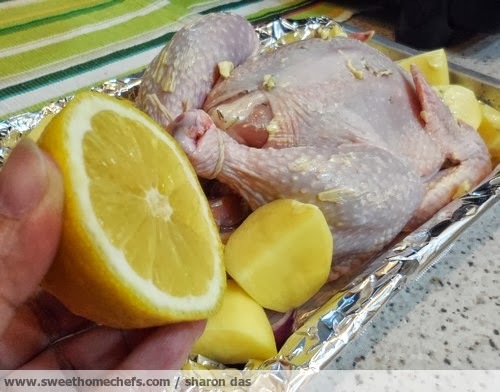 Then, stuff the lemon into the chicken. 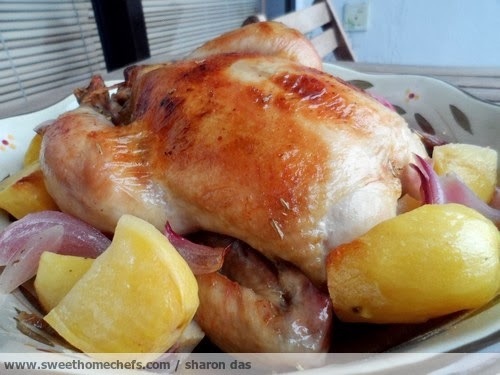 6) Roast at 185C for 1 hour 10 minutes or longer (depending on the size of your chicken). Note: I basted the chicken twice in between roasting time using the juices that had accumulated on the tray. This is to keep the chicken moist and to add a little more flavour to the skin. Butter it. Squeeze lemon juice all over. I had mine with lettuce and dragon fruit. Roast chicken with Dragon Fruit balls (used a melon baller) and lettuce. Yum! Oooo please i want that for dinner. Now that is a lovely tan your chicken has :) Love crispy skin chicken!